Minnesota atheists are helping sponsor two Twin Cities billboards, which mimic anti-abortion billboards featuring images of cute babies and childish font — only with a much different message. The billboards, which went up this week and come down Feb. 19, endorse the idea that children should not be taught religious faith. Both have the image of a smiling baby on the right side of the billboard. 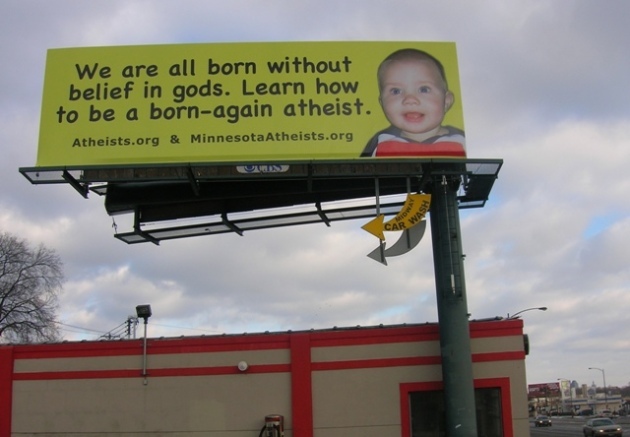 August Berkshire, president of the group Minnesota Atheists, which is affiliated with the national organization American Atheists (a co-sponsor of the billboards), told The Star Tribune that similar billboards have been going up across the country. And Minnesota Atheists thought it was time to bring them here too. “It’s (billboards) turning out to be a pretty popular way to get the message out,” said Berkshire, adding the billboards put out across the country by the Minneapolis-based group Prolife Across America were the inspiration behind the atheists’ billboards. Mary Ann Kuharski, director of Prolife Across America, told The Star Tribune the anti-abortion group is not offended at the satirizing of their billboard campaign, and that there are atheists who support their cause too.